MoneyGram International Inc. (MGI) reported a narrower loss for the fourth quarter helped by lower operating expenses. The results missed analysts’ expectations. For the full year 2019, the money transfer company issued a revenue outlook below consensus estimates. Following this, the stock inched down over 7% in the after-market session. Net loss was $12.5 million or $0.19 per share, narrower than the previous year’s loss of $52.5 million or $0.83 per share. Adjusted earnings plunged 96% to $0.01 per share due to lesser adjustments. Total revenue fell by 15% year-over-year to $345.8 million. Looking ahead into the full year 2019, the company expects revenue to decline about 2% to 4% on a constant currency basis and adjusted EBITDA to fall about 8% to 12% on a constant currency basis. 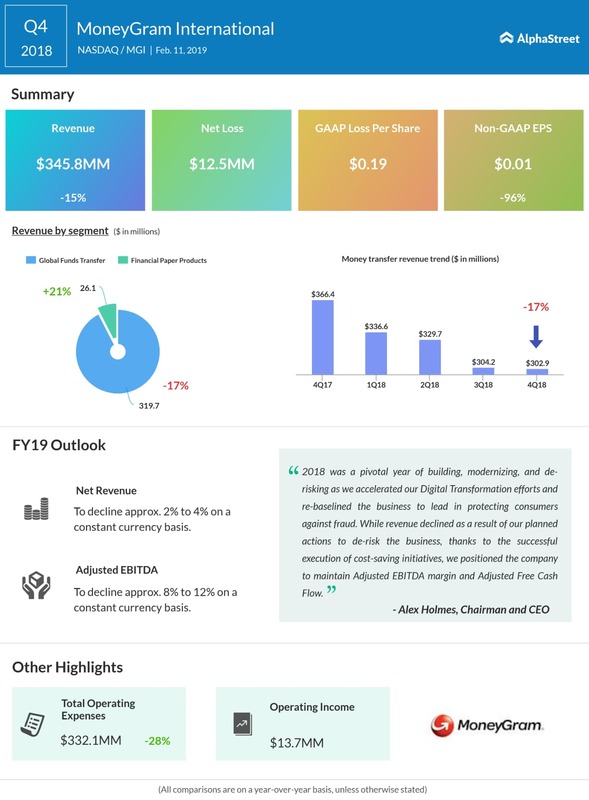 As a result of the company’s compliance changes implemented in 2018, the company anticipates the bulk of the revenue and adjusted EBITDA decline to occur in the first half of the year. The company anticipates returning to full-year growth for both revenue and Adjusted EBITDA, on a constant currency basis, in 2020. For the fourth quarter, money transfer revenue declined by 17% year-over-year, due to the impact of de-risking the business through transaction and corridor specific compliance controls implemented during the year. Total digital revenue remained strong at 16% of money transfer revenue. Higher compliance standards, introductory pricing and an ongoing decline in the US-US corridor contributed to a 7% decrease in online revenue. Online transaction growth, excluding the US-US corridor, grew by more than 25%. Investment revenue was $14.0 million, an increase of $5.2 million on a year over year basis due to higher yields in 2018. The company ended 2018 with a cash and cash equivalent balance of $145.5 million compared to $190.0 million at the end of 2017. 2018 balances include the impact of a $70 million payment to the U.S. Department of Justice. Capital expenditures were $57.8 million for the full year, down from $83.6 million in 2017. In the first quarter of 2018, the company initiated a restructuring and reorganization program as part of its Digital Transformation initiative. The company incurred $6.4 million of expenses in the fourth quarter and $20.4 million for the full year. This program, which is substantially complete, realized efficiencies that resulted in $30.5 million of expense reductions in 2018 and, upon completion, the company expects to realize $55 million of efficiencies on an annualized basis. Shares of MoneyGram ended Monday’s regular session up 12.72% at $2.57 on the Nasdaq. The stock has fallen over 76% in the past year while it has risen over 13% in the past three months.